Discover the good deals of the campsite Les Pins 3 stars in Charente-Maritime (17) and book your cheap vacation in Royan now! Looking for a camping trip with a pool at a low price? Take advantage of last minute specials or book early and pay less! Do not wait any longer and benefit now from promotional offers and discounts on the amount of your holidays and weekends to the sea! Different promotional offers are available if you want to rent a mobile home Royan cheap, or camping Charente Maritime seaside cheap: offers with a week free, specials on long-term stays … Check regularly this page PROMO if you want to stay in less expensive camping in Charente Maritime. To take advantage of this offer, contact us now by phone at 05 46 23 30 83. * Offer valid in the off-season from 04/04 to 5/07 and from 30/08 to 30/09, on all rentals of mobile homes and camping pitches. 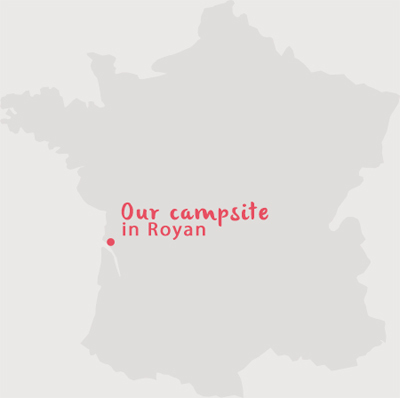 You are available for long periods of leisure … You like nature, calm, sun and sea … Come and enjoy the springtime charm of “Camping Les Pins” near Royan in Charente-Maritime! Forget everything during a 4-month holiday with family or friends! 1890 € all inclusive * … proposal for 4 people. From April 5th to June 27th and from September 1st to 30th 2015On April 5th you will move into your holiday home, a mobil-home will have it until June 27 when you have to vacate it before 11am. During this period, you can occupy it without interruption or be absent from time to time, as you see fit … you are at home. You will be able to relocate in your rent on September 1st, and will have to leave it on the 30th of this same month. * The price includes: the rental of the mobile home – water – gas- electricityYou will have to add the tourist tax as well as the additional fee: 0.605 € per night and per person over 13 years.